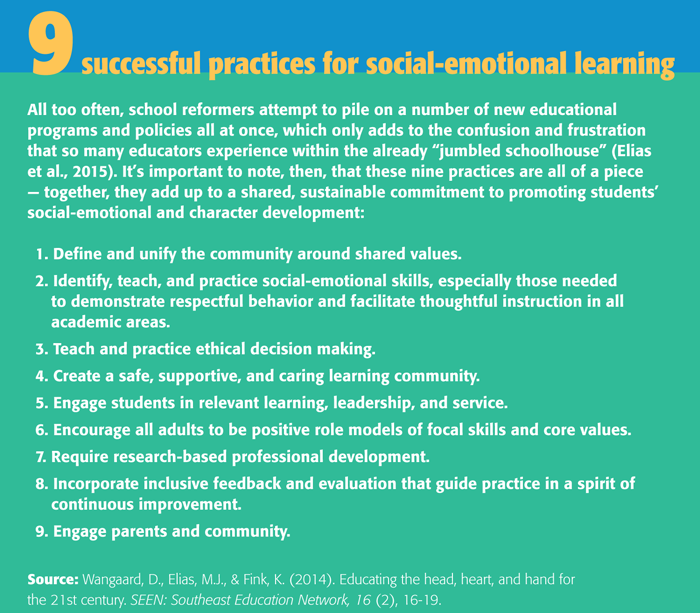 Schools need to begin to systematically include social-emotional learning for all students. Washington can play a leading role in this. Somewhere on the warm, sunny, and well-manicured campus of Stanford University, a group of children were given a choice. They could have one white, fluffy marshmallow now, or, if they were willing to wait a little longer, they could have two white, fluffy marshmallows. Decades later, researchers found that the children who were able to exercise greater self-control and wait for that second marshmallow grew up to have greater academic, social, and health outcomes. We know that self-control is a fundamental social-emotional skill, allowing us to resist distractions, make difficult decisions, work collaboratively, overcome setbacks, and refrain from yelling at our bosses. According to researchers, success in college and adult life depends as much on self-control and other social and emotional abilities as on traditional academic skills (Savitz-Romer & Bouffard, 2013). Employers, too, increasingly recognize the benefits of such competencies. After examining employee surveys and performance reviews, for example, Google found that its most effective managers were “good coaches, took an active interest in their employees’ lives, and were skilled at listening to and sharing information … [As a result, the company] decided to look at future resumes for indications of social and emotional proficiency” (World Economic Forum, 2016, p. 6). Likewise, the time has come for federal and state education leaders to ask themselves, If social-emotional and character development (SECD) is as important as researchers and employers are telling us, then what can we do to promote such development in our schools? To our new secretary of education, and to all those who play a role in shaping the nation’s priorities for school improvement, we offer a pair of suggestions: You should identify and call attention to effective, school-based approaches to social-emotional and character development, and you should advocate for structures, supports, and incentives that will allow such high-quality approaches to be implemented at scale. Next, the USDOE should call upon states to ensure that every student has opportunities to develop these social-emotional skills. This is akin to putting fluoride in the water: As a matter of course, all students, whatever their backgrounds, should have access to a positive school climate that continually supports their social and emotional health. A universal approach means also that schools must be consistent, adopting common language and goals for SECD and giving students chances to practice these skills in every classroom. But the same time, since every school enrolls some students who face greater social and emotional challenges than others, schools must also have the wherewithal to provide additional and more intensive supports to those who need them. Finally, USDOE has an important role to play in calling upon schools and districts to use evidence-based programs that have been shown to improve students’ SECD. The Collaborative for Academic, Social, and Emotional Learning (www.CASEL.org) has used rigorous criteria to vet programs for students at different grade levels, and its online guides provide a helpful starting point for states, school districts, and schools. Likewise, the organization Character.org maintains and frequently updates a roster of State and National Schools of Character that have demonstrated best practices. The Every Student Succeeds Act shifts a great deal of authority to the states to determine their education priorities and policies. But the U.S. Department of Education still has some power to “shape the path” (Heath & Heath, 2010) that states choose to take. For example, the secretary of education can call attention to the importance of SECD, disseminate information about it, provide direct support to schools that implement it, and create incentives for states and local school districts to adopt policies and practices that support it. #1. Create senior-level leadership positions dedicated to SECD. At every meeting he convenes, Amazon CEO Jeff Bezos asks for an empty seat to be included at the table — it represents Amazon’s customers, and it is meant to remind his colleagues always to keep those customers in mind. (Not surprisingly, Amazon has built a reputation for customer satisfaction.) If business leaders need to be reminded of their customers’ needs, so too must education policymakers be pushed to think about the social and emotional needs of students. In this case, though, an empty chair won’t be enough. Given that policymakers have been so blind to those needs, for so long, they should reserve seats at the education policy table for senior-level leaders who will advocate for the whole child, speaking up forcefully on behalf of SECD. Specifically, we encourage the secretary of education to create a senior staff position dedicated to SECD at the department of education. Tommy Chang, superintendent of Boston Public Schools, recently showed how this could be done when he created the position of assistant superintendent of social emotional learning and wellness (http://bostonpublicschools. org/Domain/2141). #2. Encourage the creation of state technical assistance teams and resources. As they set out to implement new SECD programs, local school districts will require a great deal of technical assistance from their state education agencies. In turn, the federal government should urge SEAs to recognize and follow through on their responsibility to provide such technical assistance. For example, SEAs can disseminate information about effective programs, and they can train consultants to work with individual districts as they figure out how SECD can be addressed most effectively in their local contexts (Elias & Leverett, 2011; for an example of such a consulting organization, see New Jersey Alliance for Social, Emotional, and Character Development: njasecd.org). SEAs and their technical assistance teams can also develop SECD implementation standards, assessments, evaluations, professional development opportunities, and policies conducive to SECD programming (such as extended school days), all of which they can pass along to the U.S. Department of Education to share with other states. #3. Encourage SECD teacher certification requirements and ongoing professional development. As the American novelist James Baldwin once noted, “Children have never been very good at listening to their elders, but they have never failed to imitate them.” His observation is particularly poignant in the context of SECD: Although teachers play a crucial role in transmitting SECD skills, many teachers are inadequately prepared to teach and model these skills explicitly. Most teacher training programs provide few if any SECD courses or distinct SECD student-teaching experiences (Schonert-Reichl, Hanson-Peterson, & Hymel, 2015), and most teacher certification requirements make no reference to SECD. #4. Create a central repository of SECD assessment information. The familiar maxim, “What gets measured gets managed” is as relevant to SECD as it is to every other part of public education. When states and districts choose to assess social, emotional, and character development (by using school climate surveys, student self-assessments, and other means), they send a strong message to teachers and schools that they should focus attention and resources on these issues. However, linking SECD assessments to accountability systems can lead to false reporting and the mislabeling of children. Thus, such measures should be low-stakes, used only for purposes of assessing school climate, gauging students’ needs, informing students about their own development, and determining how schools should proceed with interventions and programs. Further, such assessments should be tailored to fit individual schools’ goals for SECD, the populations they serve, and the interventions they’ve chosen to adopt (Elias, Ferrito, & Moceri, 2016) — what such assessments lack in standardization they make up for in nuance and usefulness. USDOE can develop a centralized repository of assessment tools, enabling states and school districts to search for and download assessments that are best suited to their needs and circumstances. The National Center on Safe Supportive Learning Environments has already made headway on this work, compiling a list of 17 school climate surveys (https://safesupportivelearning.ed.gov/edscls), which it plans to help schools implement. We urge USDOE to expand this effort by providing state agencies with guidance on using such climate surveys to inform school improvement (but, again, not to use them for accountability purposes). #5. Honor schools that do excellent SECD work. The USDOE has long understood that official recognition can be a powerful motivator for school improvement — for example, its Blue Ribbon Schools project inspired numerous schools to excel. While the department might not choose to create a new awards program for schools that promote SECD, it can support and encourage programs created by nongovernmental organizations. For example, Character.org offers a National and State Schools of Character award, and similar awards could be created for after-school programs and others focusing on social-emotional and character development (Hirsch, Deutsch, & DuBois, 2011; Maras et al., 2015). #6. Foster collaborative support structures. Just as it “takes a village to raise a child,” it takes collaboration among professional sectors to promote social-emotional and character development in our towns, cities, states, and country. Already, in the past several years, many nongovernmental agencies have come together to bring systematic, high-quality SECD into schools — examples include the Massachusetts Alliance for Social-Emotional Learning (www.sel4ma.org), New Jersey Alliance for Social, Emotional, and Character Development (njasecd.org), and similar groups in Connecticut (ei.yale.edu), Colorado (www.randomactsofkindness.org), and Washington (www.facebook.com/SELforWA). Further, some localities have made SECD a priority and have integrated it into their policy and/or administrative framework — including cities such as Anchorage, Austin, Atlanta, St. Louis, Sacramento, New York City, and Boston, plus a number of locales in New Jersey. USDOE can build on this momentum and facilitate new partnerships by convening state-level education leaders and advocacy groups and by gathering and disseminating best practices for cross-sector collaborations. While funding is always a challenge for pioneering programs in education, evidence suggests that investments in SECD pay for themselves, both in the near term, thanks to reductions in teacher dissatisfaction and turnover, and over the long term, due to cost-savings associated with reduced criminal activity and health costs as well as increased tax revenue generated by greater numbers of employable adults (Belfield et al., 2015; Heckman & Kautz, 2013). With an eye toward these long-term benefits, district leaders should integrate SECD funding into overall education budgets rather than channeling it into discrete (and less stable) line items. Further, since the benefits of SECD extend to areas that fall under the purview of several government agencies (e.g., the departments of Health and Human Services, Housing, and Justice), federal budgeting guidelines should be flexible enough to allow those agencies to make allocations in partnership with the Department of Education. While SECD programs often rely on foundations, corporate grants, social impact bonds, pay-for-success contracts, and other short-term funding sources, there is no substitute for a long-term, sustainable funding model based on consistent federal and state allocations. The time is right for the nation’s schools to embrace social-emotional learning on a large scale. Federal policymakers, particularly the secretary of education, have a key role to play in that effort by “nudging” (Thaler & Sunstein, 2008) state and local leaders to adopt and implement approaches that promise to have major benefits for the nation’s youth. For today’s students, looking toward an uncertain future, it is critical not just to achieve academically at high levels but also to connect, collaborate, solve problems, and overcome setbacks, always guided by a strong moral compass. These competencies can be taught and learned, and those of us who work in education have an obligation to ensure that our schools cultivate them. We must begin that work today. Madam Secretary, are you listening? Belfield, C., Bowden, A.B., Klapp, A., Levin, H., Shand, R., & Zander, S. (2015). The economic value of social and emotional learning. Journal of Benefit-Cost Analysis, 3, 508-544. Elias, M.J., Ferrito, J.J., & Moceri, D.C. (2016). The other side of the report card: Assessing students’ social, emotional, and character development. Thousand Oaks, CA: Corwin. Elias, M.J. & Leverett, L. (2011). Consultation to urban schools for improvements in academics and behavior: No alibis. No excuses. No exceptions. Journal of Educational and Psychological Consultation, 21 (1), 28-45. Elias, M.J., Leverett, L., Duffell, J., Humphrey, N., Stepney, C.T., & Ferrito, J.J. (2015). Integrating social-emotional learning with related prevention and youth-development approaches. In J.A. Durlak, C. Domitrovich, R.P. Weissberg, & T.P. Gullotta (Eds. ), Handbook of social and emotional learning (SEL): Research and practice (pp. 33-49). New York, NY: Guilford. Heath, C. & Heath, D. (2010). Switch: How to change things when change is hard. New York, NY: Crown. Heckman, J.J. & Kautz, T. (2013). Fostering and measuring skills: Interventions that improve character and cognition. Cambridge, MA: National Bureau of Economic Research. Hirsch, B., Deutsch, N., & DuBois, D.L. (2011). 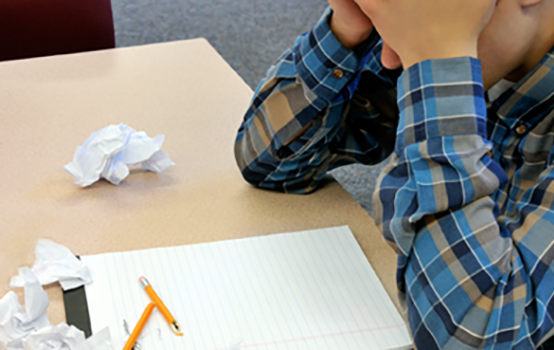 After-school centers and youth development: Case studies of success and failure. Boston, MA: Cambridge University Press. Maras, M.A., Thompson, A.M., Lewis, C., Thornburg, K., & Hawks, J. (2015). Developing a tiered response model for social-emotional learning through interdisciplinary collaboration. Journal of Educational and Psychological Consultation, 25 (2-3), 198-223. Savitz-Romer, M. & Bouffard S.M. (2013). Ready, willing, and able: A developmental approach to college access and success. Cambridge, MA: Harvard Education Press. Schonert-Reichl, K.A., Hanson-Peterson, J.L., & Hymel, S. (2015). SEL and preservice teacher education In J.A. Durlak, C.E. Domitrovich, R.P. Weissberg, & T.P. Gullotta (Eds. ), Handbook of social and emotional learning: Research and practice. New York, NY: Guilford. Wangaard, D., Elias, M.J., & Fink, K. (2014). Educating the head, heart, and hand for the 21st century. SEEN: Southeast Education Network, 16 (2), 16-19. World Economic Forum. (2016). New vision for education: Fostering social and emotional learning through technology. Geneva, Switzerland: World Economic Forum. Originally published in May 2017 Phi Delta Kappan 98 (8), 64-69. © 2017 Phi Delta Kappa International. All rights reserved. MAURICE J. ELIAS (maurice.elias@rutgers.edu, @SELinSchools) is a professor and director, Social-Emotional and Character Development Lab, Department of Psychology, Rutgers, the State University of New Jersey, Piscataway, N.J.
SAMUEL J. NAYMAN is school liaison for the MOSAIC Project, Social-Emotional and Character Development Lab, Department of Psychology, Rutgers, the State University of New Jersey, Piscataway, N.J.
JOAN C. DUFFELL is executive director of the Committee for Children, Seattle, Wash.
SARAH A. KIM is lab coordinator for the MOSAIC Project, Social-Emotional and Character Development Lab, Department of Psychology, Rutgers, the State University of New Jersey, Piscataway, N.J.